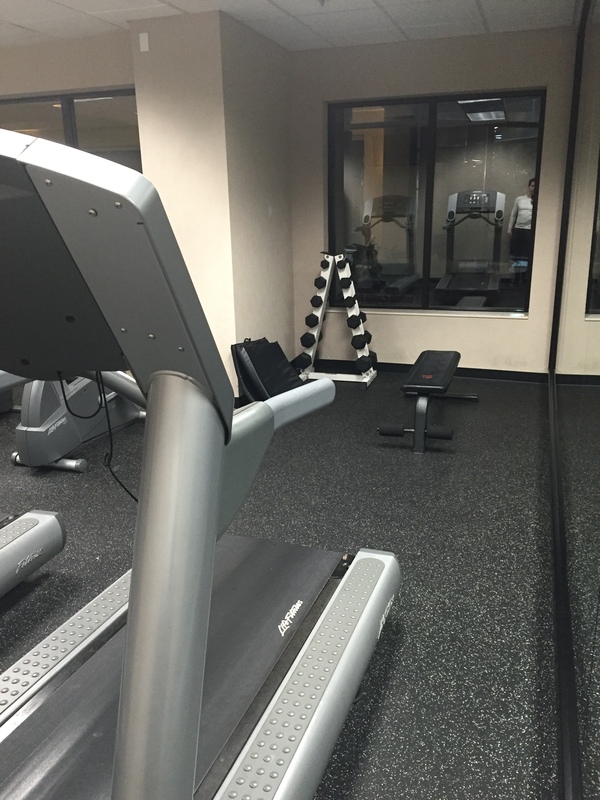 OK – I admit it, I am completely sick of the hotel gym with dumbbells that go through a whopping 50lbs (or in my latest adventure – 30 lbs) and the obligatory elliptical machine and (non-functional) treadmill. It may just be the fact that I have been on the road a lot lately but it is getting old……fast. So you can imagine my elation when I walked into the gym at the hotel on the first leg of my most recent trip and saw her standing in the corner. She was a 7 foot beauty. Strong. Lean. Shiny. The cable cross over machine of my dreams. You mean I can actually do a pull up!?!?! Oh how my expectations soared. Pull ups, axe choppers, triceps extensions…….the possibilities were endless. Until my dreams were crushed. You see, the only attachment available for this wonderful piece of equipment was a straight bar. What!?!!? No rope? No single handles? No rowing handle? How dare you crush my dreams!!! It was time to improvise. For a very brief moment I felt like Ed Harris in his portrayal of the NASA scientist in Apollo 13. “OK Gentlemen. Here is what they have in the capsule. How do we make a square peg fit in a round hole?” How do I make this work? Then I went to work. Scouring the room for resources. What could I do? What could I use? And then, like a shining white light of salvation in the corner of the room I saw them. 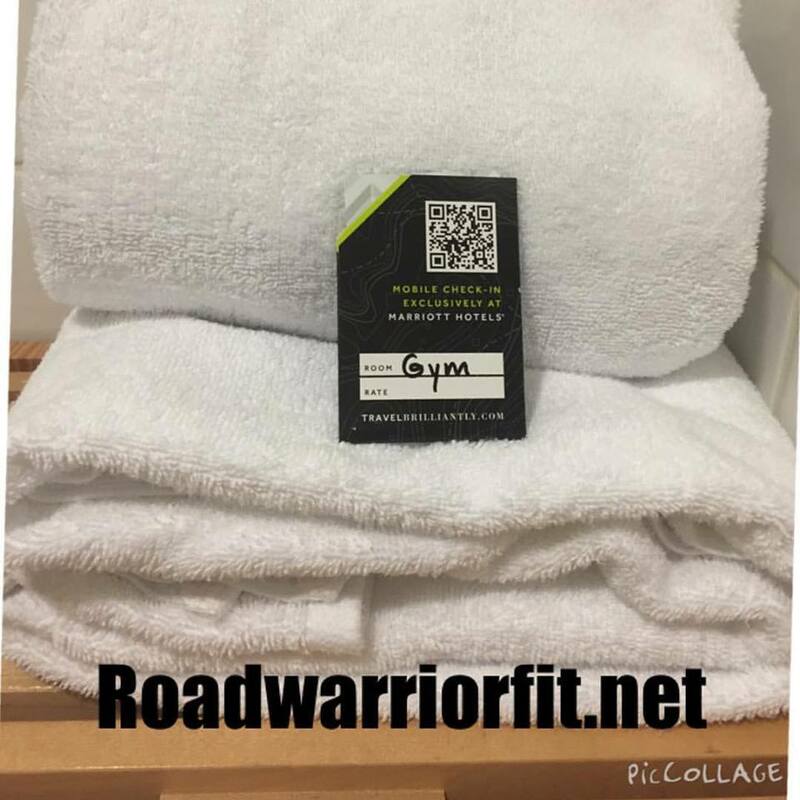 Your simple, everyday gym towel would come to my rescue. Throughout my training I have often incorporated towels, gi belts and other fabrics into my workouts to train my grip. This night was going to be all about using the towel to facilitate my workout. With the way I feel today, I can tell you that I will be doing this on a regular basis. My forearms are still on fire and the rest of my upper body is more sore (in all the right ways) than it has been in quite some time. So how did I incorporate a towel(s) into the mix? Here’s how. Pull up – throw the towel over the bar and suddenly you have offset grip pull ups (these are no joke people). Switch your hands and you have offset grip chin-ups or the one I hope to actually accomplish someday, towel grip pull ups. Crossover cable: Triceps extension…done. Upright rows….done. Wood choppers…..done both up and down. 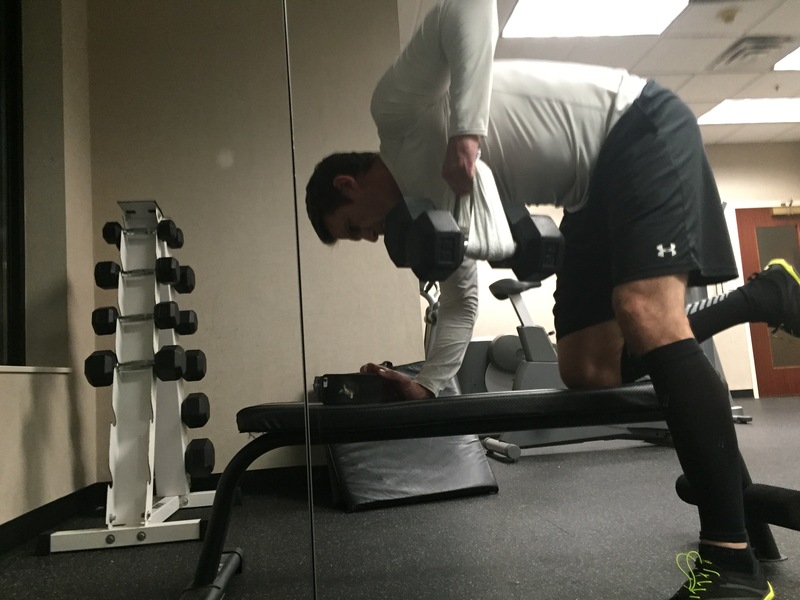 Weighted crunches…..done. 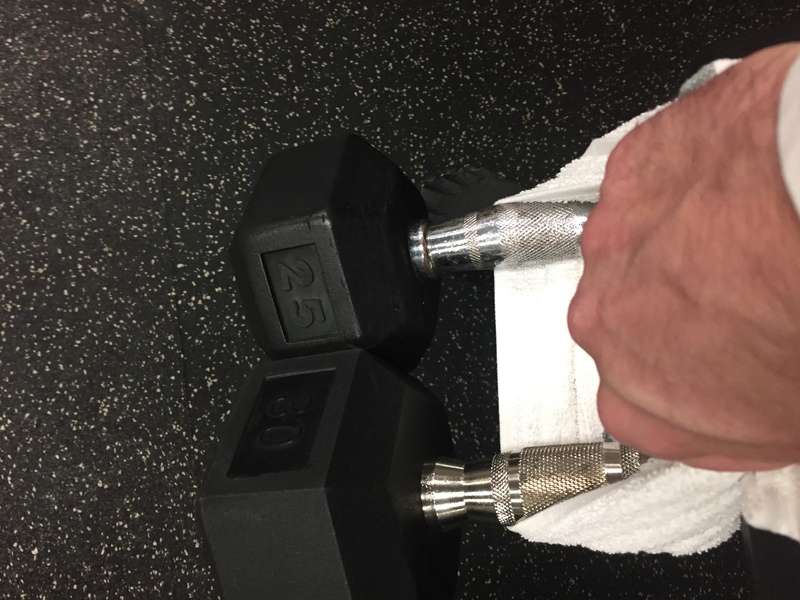 Bicep curls…..done. With dumbbells: Need 70lbsers? No problem, grab the 30’s and the 40’s and wrap the towel around the handles . Now not only do you have 70lbs per hand but the weight will shift on you which engages all of the smaller stabilizing muscles. Improved Ab work: Ever seen those floor sliders to allow your feet to effortless glide across the floor almost eliminating friction? Yeah, towels come close (double trick, hit up the breakfast buffet for a couple of paper/plastic plates instead of a towel). Suddenly my abs are begging that we go back to the world of just trudging along on the treadmill. 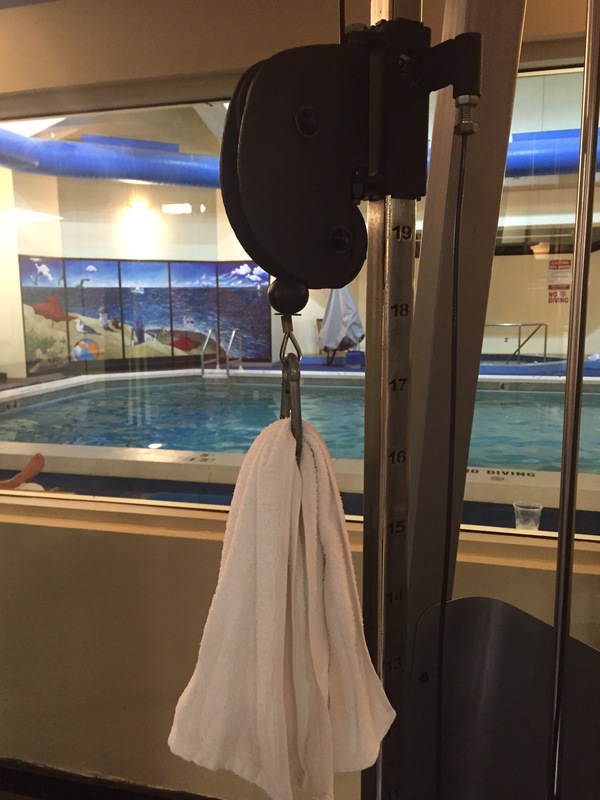 So the next time you find yourself discouraged by either the type of equipment available or the condition of the equipment, think about the humble towel and how you may be able to put it to work for you. At least once or twice a year, I have a week of travel that looks great on a calendar. The kind of week, like the one I just started, where I have 6 different in person meetings across six states in 5 days. The kind of week where on the last leg of the trip you find yourself chanting “never again” over and over like it is a tantric mantra. This week I will find myself on six different planes, 4 hotel rooms, 3 rental cars, 2 different trains, countless taxi/Ubers and (fortunately only) 2 time zones. I think I will literally be spending an entire day in some type of mode of transportation this week. Crazy. So how do you prepare for a marathon week like this one? First of all, you prepare. Heading into a period of travel like this without making preparations is setting yourself up for disaster. And I mean going past planning on what you are going to wear and what weather to pack for. You need to prepare yourself, your family and your coworkers for the craziness of weeks like this one. How you ask? This is a big one for me. I have a very bad habit of not communicating to my wife early and often about upcoming weeks like this one. After over a decade on the road, she pretty much assumes that I am going to be traveling each and every week but weeks like this are the exception. Of course this is also the week my eldest son decides to throw a relational grenade in the middle of the living room. Oh, and wrestling season is starting with two different evening events. And my youngest son has an orchestra commitment. And, and, and……. While there is never a good week for this type of trip, this is a particularly bad one. Of course, I waited to communicate the schedule this week so it caused grief for all involved. You also need to communicate with your coworkers. Normally I am very flexible with how and when I will take phone calls and do webinars. Did you catch the fact that I will be on a plane/train for nearly 24 hours this week? Pretty hard to conduct a webinar from 38k feet. Communicating this early and often with your teammates will only benefit all of you. One of my wife’s love languages is Acts of Service. I have written about it before (read it here) but I spend my Sunday’s planning but this Sunday was even more intensive than most. 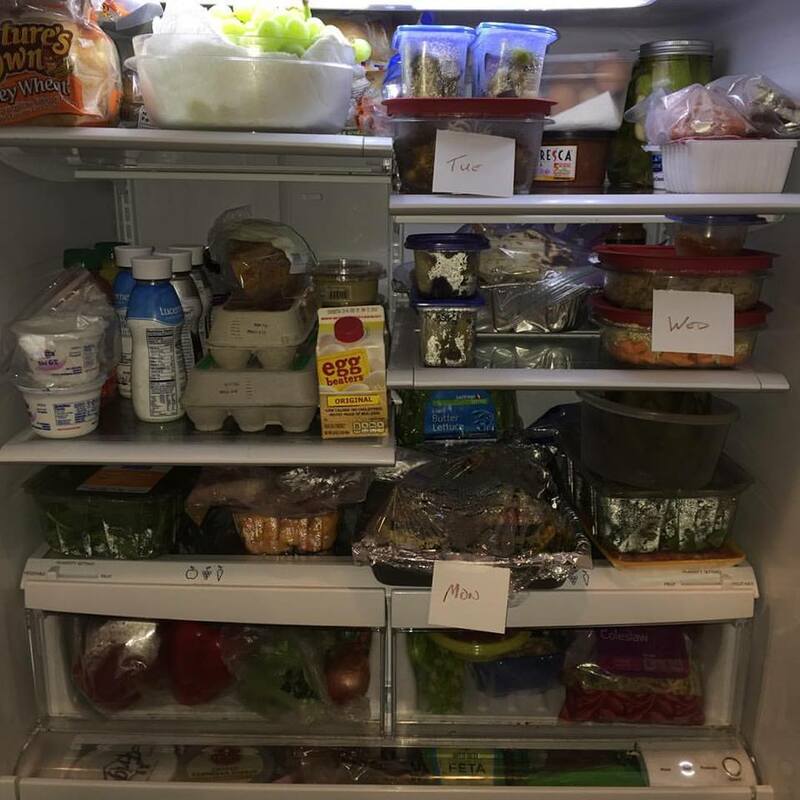 I always plan the menu for the week and shop for the groceries but this week I also prepped all of the meals. I made sure the laundry was done and put away. The garage was cleaned out so the car could park in it. Why? So when her day gets a head of steam, or a hail storm rolls through, she is not letting the dinner storm or the literal storm derail the family. The more I can make sure is ready to go (Monday’s dinner, Wrestling Singlet cleaned and ready to go, PE Clothes cleaned, lunch accounts having full balances) – the better the week will go. Does that mean I get to sit on the couch and watch football all Sunday? Nope. But I can tell you that when I leave and our refrigerator looks like it did this morning (above) than there is zero complaining about the games being on all Sunday when I am in the kitchen making this happen. It also makes reentry on Friday night, way better. Yes, I schedule my flights and meetings but I also have to schedule my workouts and meals on weeks like this. I do not want to find myself at the airport looking to board a late flight having not worked out and not eaten. It is a recipe for late night fast food and running to the gift shop for Tums. Not good. It also means thinking ahead to the schedule of the week for those around you. How can I make the upcoming week easier to deal with? Are the clothes ready for any special events? Are there days where you know if you are going to get a Facetime conversation with the kids in that it has to be in the morning? Can you reposition anything scheduled for the upcoming week into another time slot to make everyone’s week go a bit smoother? Now that I think about it, prepping for weeks like this all boils down to putting others first. 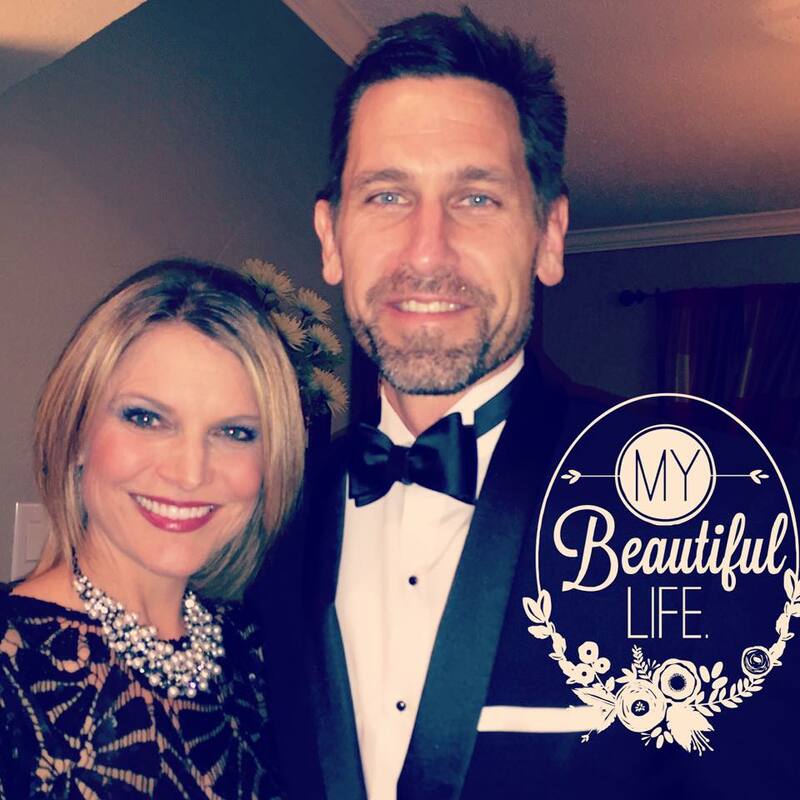 When we as RoadWarriors are on the road – it is an inherently selfish time. We can’t deal with the trials, tribulations, arguments and meltdowns that are happening at home. The best we can do is help to avoid them in the first place. So wish me luck this week and maybe I will see you in one of the 6 airports I get to visit this week. Do you exercise, work out or do you train? Let me start off by saying there is no “right” answer to the question above but how you answer tells a lot about your attitude towards fitness. It is actually a question that I have really struggled with recently. Maybe it will help if I define the three options for you. The person who says “I am going to go exercise” typically does not have a real plan in place. They may be the one who hits the hotel gym and decides based on availability as to whether they are going to run or hit the elliptical that night. Now mind you, they are still ahead of 28.3% of Americans, who according to the Physical Activity Counsel have done NO EXERCISE AT ALL over the last 12 months…..and they even included walking the mall as a form of exercise!! The reality is this group is also the least likely to see any type of real and persistent results from their efforts. It is also the easiest mindset with which to skip altogether and find yourself among the 28%. These are the people who typically have at least a semblance of a plan. They know the muscle group they are going to target or the cardio exercise for the day. They are usually intentional in their workout and they may even have specific goals for the work out (for example, today my goal was 40 minutes on the treadmill at 7 mph). They make their time for their work out a priority. These people have a specific goal in mind. For some it is a race (think marathon running), for others it is a competition (fighters and bodybuilders), others still it is an amount of weight to drop. For me it has been various rank advancement in karate or the occasional grappling tournament. There is a different intensity to the workouts but more importantly, there is a different intentionality. You are there in the gym, or on the mat, or on the road with a specific goal and purpose all of which leads up to a larger result. So why bring this up at all? Because I find myself in a time of transition. For the last 7 years I have had something to train for and right now, I don’t. A random set of circumstances has really thrown my training off the rails. Schedule changes at the dojo preventing me from getting in regularly. Work obligations getting in the way of my lunch BJJ sessions. All of these have conspired to put me in a spot where I am not training for anything specific right now. There have actually been moments over the last few months that I have found myself walking into the gym with absolutely no plan…..and it terrifies me. The good news is I am still walking in the gym or pressing play every day though. The reality is that people who have something to train for are more intentional about their exercise regime and far less likely to miss a workout. No- I don’t have a study to back that claim up other than the anecdotal evidence and my own experiences but the bigger question is how do embrace that fact and apply it? I want you to think back to High School Physics class and to Newton’s first law of motion. Do you remember? Intentionality is that external force to our stagnation. The Big Hairy Audacious Goal (BHAG for all of you Good to Great fans) is what moves people from exercising to training. You have to have something you are working towards, or running from, that is so motivating that you not only exercise but you do so with intention. I am on the hunt for mine now and I will be sure to share it when I identify it. I am one of those weirdos that are not motivated by a number on a scale but by the things I am able to achieve. That doesn’t mean that the chasing a number is wrong, it is just not what does it for me. So what is it that will take you from exercising to training? What is your BHAG? Can’t wait to hear from you.